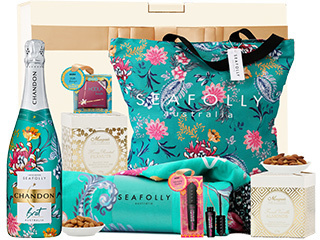 Say no to disappointing gifts with Australia's most stunning range of luxury pamper hampers. We've all left our special someone feeling disappointed with a gift just didn't live up to expectation. With over a decade of pamper gift expertise, we're here to say yes to ensuring your loved ones feel like the most cherished person in the world. Isn't it time you spoilt them a little? Or a lot? 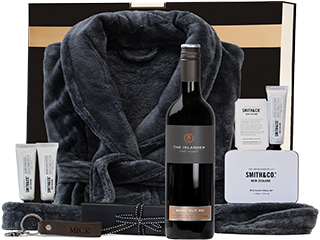 Backed by over a decade of gifting experience, if you're looking for a luxury gift to impress, or to pamper someone special, then you've arrived at Australia's best online gift store for pamper hampers. Not only do our luxurious hampers include the world's most sought after brands across all categories including skincare, champagne, liquor and of course gourmet food, each hamper is presented with a unique level of luxury that is what sets The Hamper Emporium apart from our competitors. Our specially designed keepsake gift boxes make a beautiful impact from the moment they arrive at the door. From our beautifully custom designed postal boxes, through to our luxury keepsake gift boxes finished with a satin ribbon, to our stunning presentation of the world's best pamper gifts tucked neatly inside. Our hampers are all about quality, making you look great by sending a wonderful gift, and making your recipient feel great, loved and appreciated. Pamper Hampers are the perfect choice for special occasions such as Valentine's Day for him or for her, Mother's Day, Father's Day and especially as Anniversary gifts. Even better, our pamper hampers include FREE Delivery right to their door. What Pamper Hampers Are Good to Give as Gifts? All pamper hampers at the Hamper Emporium make great gifts! Since the hampers are designed to provide your recipient with a pampering experience, you could consider one of these pamper hampers for Mother’s Day, birthdays, Christmas, and many other special occasions. To ensure customers always get the best pamper hamper for their recipient, our team regularly creates new options for the pamper hampers collection. In our range, you will regularly find new pamper hampers for both men and women. So, even if you've purchased a pamper gift hamper for someone special before, there's sure to be a new gift hamper in stock and ready to have them smiling for the next special occasion, so they'll never recieve the same gift hamper twice. Why Are Hamper Emporium’s Pamper Hampers tThe Best Mother’s Day Hampers? Here at The Hamper Emporium, we truly believe that mums keep the world turning, and mums deserve the most beautiful gifts of all (don't worry, we love our dads too and have a wonderful range of Father's Day gifts for him). Even though you must take your mum’s preferences into consideration to a certain degree, our range of Mother’s Day hampers include a stunning array of pampering products to ensure that she'll be overjoyed with happiness at the beauty and luxury contained inside our Mother's Day gift hampers. In today’s world, it is not uncommon for mums to live extremely hectic lives, which means they could certainly use some relaxation! With the many pampering products inside our Mother’s Day hampers, such a relaxing experience is guaranteed. So, when you need some Mother’s Day hampers in the future, be sure to check the pamper hamper collection first. Can I Use These Pamper Hampers as Thank You Hampers? Do you want to say thank you to a special lady in your life? If so, you can certainly use these hampers as thank you hampers too. With this collection of thank you hampers, you can say thank you in a way that ensures she truly understands just how loved and appreciated she is. To make our thank you hampers extra personal, we include a free greeting card with each of our thank you hampers. Customers can add a personalised message beforehand, so she'll know that this beautiful hamper is a gift from you to her. So, when you choose a pampering hamper from the Hamper Emporium, everything is taken care of. What Are Some Pamper Hamper Ideas? Customers who need some inspiration for their recipient can get some amazing pamper hamper ideas from our online catalogue. In this collection of pamper hampers, you can find some of our latest additions, but also some of our trusted and proven pamper hampers that have been a big hit for customers for years. So, don’t spend hours looking on the net for inspiration, because you can find it right here at The Hamper Emporium. What Ladies Pamper Hampers Are Available? As mentioned briefly earlier, The Hamper Emporium provides dedicated pamper hampers for both men and women. 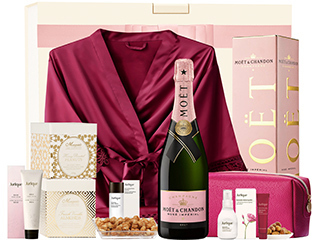 We've worked closely with the world's most beautiful brands to ensure that our women's luxury pamper hampers feature stunning gifts from brands such as L'Occitane, Moet, plush soft robes and more. Our range is ever-evolving so that we can bring you the best options with beautiful inclusions she'll love. Keep an eye out for our Limited Edition Women's Gift Hampers. 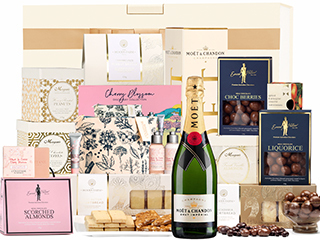 We work closely with our suppliers such as Moet, to bring hampers packed full of exclusive and limited edition gifts for her so she truly feels special and one-of-a-kind. 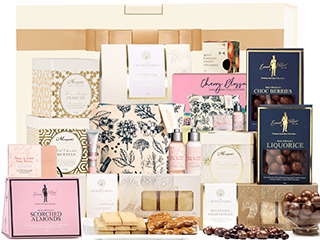 What Luxury Pamper Hampers Are Popular for Mums? Do you want to pamper your mum with the ultimate pamper hamper? If so, then we can suggest any of the popular pamper hampers below. Any pamper hamper below will provide your mum with an amazing pampering experience, but also send a lot of love her way. One of the most elaborate pamper hampers at The Hamper Emporium is the L’Occitane Pamper Hamper. This hamper was created to provide your mum with the ultimate pampering experience, so customers can expect an astonishing range of pampering products. For the L’Occitane Pamper Hamper, our hamper designer picked three amazing products from L’Occitane, giving your mum some outstanding skincare. It also includes countless gourmet nibbles and chocolates from chocolatiers such as Ernest Hillier and Butlers Irish Chocolates. If your mum is a big fan of exquisite champagne, then you cannot pass on this amazing women's gift hamper. 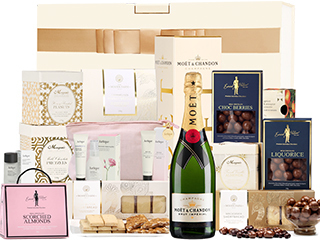 The Jurlique Pure Indulgence Hamper contains a genuine bottle of Moet, along with a large selection of complementing chocolates, sweets and nibbles and a beautiful selection of Jurlique skincare. This world-class skincare features natural ingredients that are beautifully nourishing for mum's skin. What more could mum want for her pampering experience? The Jurlique with Personalised Leather Accessories Hamper is quite like the hamper we described earlier, the Jurlique Indulgence Hamper. However, the Jurlique with Personalised Leather Accessories contains some leather products that can be personalised with the monogram of your recipient, making the hamper a little more personal! To add the monogram of your recipient to the personalised leather accessories inside this hamper, simply add the letters of your recipient’s monogram to the designated field on the product description page. Then, simply add the hamper to your cart and our expert team here at The Hamper Emporium will take care of the rest. Is There a Pamper Hamper for Dads Too? At The Hamper Emporium, customers we know it can be difficult to find the perfect pampering gift to make men feel special, which is why we've worked closely with our favourite brands to create a hamper that will help him kick back and relax in style. One of these pamper hampers for men is the Men’s Ultimate Retreat Hamper! The Men’s Ultimate Retreat Hamper contains all kinds of products that can give men a true spa experience from the convenience of their own home. It contains the most fabulous plush bathrobe, but also hand wash, lotion and a 2014 the Islander Estate Old Rowley Shiraz Grenache! What Should You Put in a Pamper Hamper? There are several things you could put in a pamper hamper. You can see some examples of pamper hampers at The Hamper Emporium, which contain items such as skincare products, chocolates, sweet nibbles, champagne, sparkling wine, and loads more. Over the past decade, we've refined our luxury gift hampers to include items that we know your recipients truly want to receive. Forget supermarket brands, we only work with the world's finest brands and Australian artisan producers so that you know your recipient will be blown away by both the luxury and presentation of their gorgeous hamper. Where Can I Find More Pamper Hampers? The Hamper Emporium is so proud of its pamper hampers, our team has created a special category just containing pamper hampers! Therefore, for a full overview of pamper hampers, simply head over to the main menu and select “pamper hampers” for a clear overview of your options. Please note that The Hamper Emporium provides other hampers as well, so your choice is not limited to our category with pamper hampers. For more options, please check out the other categories on our site!